Swedish, original surname Svendberg. 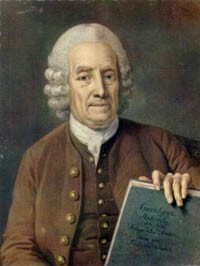 Swedish scientist and theologian whose mystical ideas became the basis of a religious movement. Swedenborgianism or Swedenborgism, the system of philosophical and religious doctrines of Emanual Swedenborg, emphasising the spiritual structure of the universe, the possibility of direct contact with spirits, and the divinity of Christ. This provided the basis for the New Jerusalem Church (or New Church) founded by Swedenborg's followers. A relation to man in each and all things of the animal kingdom is plain from these considerations; Animals of every kind have limbs by which they move, organs by which they feel, and viscera by which these are put in motion. These they have in common with man. They have also appetites and affections similar to those natural to man. At birth they jave knowledge, corresponding to their affections, in some of which appears something like the spritual. This is more or less plain to the eye in the case of beasts, birds, bees, silkworm, ants, etc. From these facts it is that altogether natural men assert that living creatures of this kingdom are like them, apart from speech. Emanuel Swedenborg : a biography (link to archive.org) by James Wilkinson, Boston, 1849. p.238: He writes on the subject in his Arcana as follows: " Considered apart, eating the flesh of animals is somewhat profane...."